Growing up, I had the privilege of living in the same town as my grandparents, Bob and Pauline Ness. They helped raise me, and were present for almost every sporting event, musical performance, and other major life events. When I look back and think about my childhood and adolescence, I remember them at everything. These memories became especially important after my grandpa started showing signs of dementia around the time I went to college. Because I was only an hour and a half away, I would often drive back to Story City and spend a couple hours on the weekend reminiscing with him. A few memories would always make him roar with laughter. My grandpa passed away a few years ago to Alzheimers and those memories have been near and dear to my heart ever since. Recently I saw my grandma and shared some of my memories of grandpa with her. In return, she reminded me of one that I hadn’t remembered. “Funtascup” – This was a word or expression that Grandpa would frequently use when something did not go according to plan, when he could not figure something out, when things were out of his control and when he was frustrated. When his kids and grandkids would question the origin, they were told the word was as Norwegian as “Ufda”, kumla and munga tuk. When we were writing his eulogy we asked someone who spoke Norwegian what it meant. We were surprised to find out it was an actual swear word! This was a surprise considering my grandpa was the last person who would ever use a curse word in front of us—though it would be just like him to excuse it if it’s in another language. We included it in his eulogy and everyone had a good laugh over it. This Grandparents Day I thought about all the great memories I have with my grandparents and all the lessons they taught me growing up. Perhaps the most important after all was to choose your words carefully—you never know what words people will remember you most for. As Generations United celebrate Grandparents Day and honor the contributions of grandparents in children’s lives, we are proud to announce the release of Grand Successes: Stories of lives well-raised. Grand Successes tells the stories of just some of the many successful individuals raised by their grandparents or other grandfamilies. 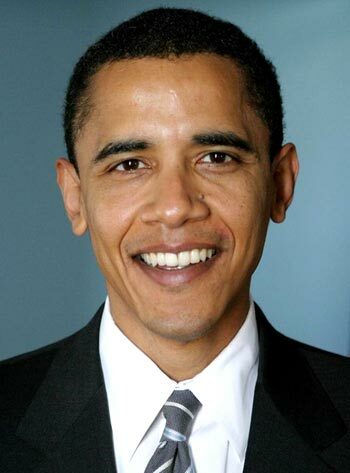 Today we’re featuring the story of President Barack Obama. The President of the United States had a very close relationship with his grandparents during his childhood in Hawaii. The values grandparents instill in their grandchildren have great implications, and this could not be more evident than for the grandparents of the commander in chief of the country. Obama’s parents were married for only a short time after his birth. Obama Sr. was a native of Kenya, and returned to Africa while his son was still young. Obama’s mother married a man from Indonesia shortly after her divorce from Obama Sr. and took her son with her to Indonesia. When Obama was ten years old, he returned to Hawaii and to his loving grandparents. 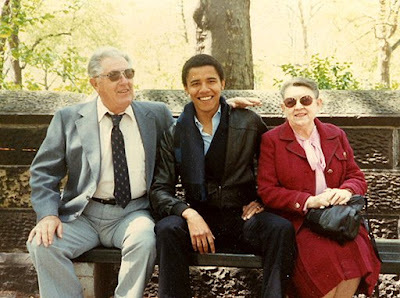 “Toot” (the affectionate nickname Obama had for his grandmother) and Stanley Dunham raised their grandson with love and sacrifice, even sending him to a prestigious school in Hawaii. Speaking about his grandmother, Obama said, "She's the one who put off buying a new car or a new dress for herself so that I could have a better life. She poured everything she had into me." Obama also credits his determination to his grandmother. “She's where I get my practical streak. That part of me that's hardheaded, I get from her. She's tough as nails." His grandmother helped support her grandchildren by working at a bank, at a time when far fewer women were in the workforce. Toot passed away just two days before Obama was elected as President in 2008. A month prior to her passing, Obama had taken a respite from campaigning to visit with his ailing grandmother. Although Toot was not able to see her grandson “Barry” become the commander in chief of the United States, she undoubtedly was proud of all that he had achieved. Perhaps this is why the First Lady’s mother also lives in the White House. The President understands the importance of a relationship with a grandparent. Every year my grandfather, Jefferson Clark, would travel from Washington, DC to Hamden, Connecticut to visit with his daughter and her family. Then he would go to Egg Harbor, New Jersey to visit with another daughter. In 1938, when I was 12 years old this picture was taken with three of his grandchildren. All of us admired this man who fathered seven children; left Selma, Alabama in the 1890’s after being threatened by white supremacists for writing about segregation, and came to Washington, DC to work for the federal government. His stature and overall demeanor was impressive. He set a good example for us in the way he carried himself, the stories he told us, and most important his sense of humor. The older I got the more I respected the example my grandfather had set. I was 20 years old when he died 65 years ago but I can still see him walking down Marlboro Street swinging his cane. Grandparents Day Profiles: How Did You Do Something Grand? Throughout the week, people across the country have been joining together to Do Something Grand for Grandparents Day. We wanted to take a minute to feature some of the great activism projects we’ve heard about. Check out the projects below! If you did something grand for Grandparents Day we want to hear about it! Share your story with us and we may feature it after Grandparents Day! Windsor Place of Coffeyville hosted a “GRAND” Olympics with an emphasis on “Proud to be an AMERICAN” for the students in their Age-to-Age program and residents of Windsor Place as the main event to coincide with Generations United’s Grandparent’s Week. Throughout the week, during centers in the classroom, the Elders read books about America to the children. Olympic activities included: a joint coloring contest of the American Flag for both Elders and children, a day of Olympic events where the children will compete on teams with the Elders to do physical activities, opening ceremonies that include American songs and poetry, and an intergenerational American trivia day. Additionally, the children invited their natural grandparents to join them and their adopted Grandparents at Windsor for song, games and snacks. The children also joined the Elders for a reminiscence group where the Elders and the children will discuss memories they have of their Grandma. On Friday, there will be an Olympic Spirit Social for the students and Elders. This community brought high school students and older adults (RSVP Volunteers) together during Grandparents Week (September 8-15 ) to discuss and share knowledge about voting history, their experiences of voting and the importance of civic engagement through voting. Students and older adults who shared a classroom experience gained knowledge about the history of voting, heard personal stories, and reflections on voting that assisted students in embracing their civic responsible to vote. The American Government Instructor at the High School scheduled two classes to include older adults during Grandparents Week. Six or more older adults and approximately 25 students in each class joined together to share history, information and stories on voting in America. Students were involved by asking questions and giving their views on voting. The JCA Heyman Interages Center engaged their volunteers and program participants in a meaningful discussion about civic engagement and the impetus for their intergenerational choice in volunteerism. The Interages staff video taped interviews with young children and their father who regularly volunteer at an assisted living facility, as well as some of the frail elders who have participated in student visiting programs. Additionally, volunteer mentors were videotaped and responded to questions about their civic engagement. All the videotaped conversations will be sent to the local government in honor of Grandparents Day sharing how much The JCA Heyman Interages Center appreciates their support of intergenerational programs. You can watch the videotaped interviews here! How did you Do Something Grand for Grandparents Day? I remember going to visit my grandparents in Utica, NY (a couple times a year) and knowing that there would be lots of homemade baked from scratch goodies waiting for my family’s arrival. My grandmother would bake my dad’s (her son’s) childhood favorites along with those of my mom, my brother and myself. During our stay, we would bake more to make sure we had a different dessert every night after dinner, and plenty of homemade treats during the day. I knew, as a child, that baking was something my grandmother not only enjoyed, but also a way that she expressed her love for others. As I got older, I began to bake, and realized not only do I enjoy the actual art of baking, but also making others happy by baking their favorite treats, just like my grandmother. I, learned from the best, and only bake from scratch, just like my grandmother. Every Thanksgiving, I make pumpkin cheesecake, a favorite of many of my guests, especially my grandmother. My grandmother and I are passing on the love and enjoyment of baking to my daughters. Now, every time I bake, I have 2 or 4 extra little hands measuring, pouring, mixing and tasting. I don’t know which part is more fun – laughing with them as they make a mess, accomplishing our goal or enjoying the final product! I often have conversations with my grandmother about baking, recipes and sweets in general. There is nothing like food to elicit conversation and connections. Happy Grandparent’s Day, Oma……….I’ll be over with some black forest cake later! My grandmother was married 3 times and she outlived all three of her husbands. Her last husband, known as “Mr. Jim” and referred to as “Big Daddy,” reminded me of a kind-hearted old workhorse. He chewed tobacco and would not let us play cards in the house, nor could we listen to the radio on Sunday. Being the resilient children that we were, we found other places to play where we would not get caught with the cards. During the visits to North Carolina we had a wonderful time playing on my grandmother’s farm. Granny had nine children and also raised two of my mother’s nephews (with nine children already, what were two more?). There were always plenty of other children to play with, and hide-and-seek was a favorite, as there were so many good places to hide on a farm. It was great sport to harass the chickens, feed the pigs and hide near the outhouse. It was a great improvement when a bathroom was installed on the enclosed back porch but it was still a chilly venture. Granny was very frugal and children were the recipients of the thinnest slice of her rich, buttery pound cakes. And you dare not make your dishpan water too sudsy as this was an indication that you had used entirely too much soap! In her later years, she developed a skin condition known as vitiligo and in my naïve youth I thought it came from drinking water from the well. I remember when my mother brought her up North to live with us a short while, the doctors wanted to give her a pacemaker but she was having none of that. And she was right. In a short period of time, whatever was wrong with her heart corrected itself without the pacemaker. Another time I was upstairs in my bedroom reading a book and finally realized that someone was calling my name, “Tina,” “Tina” I heard faintly. When I ran downstairs, I found my grandmother lying on the floor beside the bed. She had just missed falling into a glass storm door pane left leaning against the wall. Even though I was visibly shaken, I made light of it by putting my hands on my hips, cocking my head to the side and saying, “Granny, now what are you doing down there on the floor?” She laughed when I said that, and as I helped her get up and back into bed, I thought that bones must get heavier with age because it was extremely hard to lift her. My fondest memory is combing her thin silver hair as she sat in a chair in the dining room. As I was combing her hair, I told her that she looked like an old Native American and that made her laugh gently and smile. Before she passed at the age of 94, she said she was “tired, just tired.” To this day when I tease my 86-year-old Mom by calling her “Miss Fannie” we laugh together in memory and understanding as we both know that name means the spirit of Grandma is nearby. As Generations United celebrate Grandparents Day and honor grandparents, we are proud to announce the release of Grand Successes: Stories of lives well-raised. Grand Successes tells the stories of just some of the many successful individuals raised by their grandparents or other grandfamilies. Like Shea McClellin and Jimmy Wayne, country singer and American Idol alum Kelli Pickler has found fame and success because of the support and love of her grandparents. Pickler has been involved with Generations United for some time, and lent her voice to celebrate and encourage other grandfamily caregivers and children at the 2008 GrandRally. When asked how she found the courage to audition for American Idol, Kelli Pickler has a ready answer: her grandparents, Faye and Clyde Pickler. The bubbly, energetic country singer says her grandparents’ love and devotion gave her the confidence to forge ahead with a singing career. Pickler’s parents had had a tumultuous relationship, separating when she was just two years old. Her father struggled with addictions to drugs and alcohol and couldn’t care for her properly. Consequently, Pickler’s grandparents became her primary caregivers when she was very young. Their willingness to step up and provide the best for Pickler is undoubtedly a great factor in the singer’s success. Pickler’s grandmother, Faye, piqued her interest in music. “[My grandmother] had a collection of children's books, and one of those was a songbook. We would sit on the swing on the front porch, and I would just sing my heart out,” Pickler recalls. But it was her grandfather, Clyde, who took Pickler to her American Idol audition and succeeded in calming her before her performance. “He said, ‘Sit down Kelli, we're here now, what do you have to lose?’” The rest is history—Pickler had nothing to lose, and all to gain. Music saved Pickler when her grandmother passed away while Pickler was still in high school. Like any great artist, she eased her pain through a creative outlet. Her first album closes with a song called “My Angel,” a heartfelt tribute to her grandmother. Pickler has not shied away from opportunities to encourage those who find themselves in situations similar to hers growing up. Demonstrating her appreciation for the care and support of her grandparents and the millions of grandparents raising grandchildren across the U.S., Picker sang “My Angle,” and spoke words of encouragement to nearly 1000 grandparents raising grandchildren and their supporters at a national GrandRally in front of the U.S. Capitol in Washington D.C. in 2008. And Pickler’s tribute to her grandmother travels with her wherever she goes. Each time Pickler climbs into the RV that serves as her home away from home while on tour, she’s reminded of her beloved “Grandma.” The name she gave her RV? Faye. September 11, 2001 is a date our country will remember forever. Although it was a day that began in horror, It was also a transformative time that brought members of every generation together. We gathered as one to mourn and to honor those who lost their lives, those who survived, and those who bravely rose up in service in response to the crisis. Since then, millions of Americans spanning all ages have continued to come together on September 11th to serve and remember. Generations United believes that intergenerational service and volunteerism can strengthen community cohesion and enable us to tackle some of the most pressing issues challenging this country. Today we honor the memory of those we lost by giving back to our communities. As President Obama said in a recent weekly address, “We are one American family. We look out for each other. Not just on the difficult days, but every day.” Join us as we remember 9/11 and serve our communities to make a lasting impact for the next generation. You probably know Jimmy Wayne as a country music star, but do you know the story of how he got to where he is today? Jimmy Wayne grew up in Kings Mountain, North Carolina with his older sister and mother. By the time he was 14, he had been in and out of the foster care system and attended 12 different schools in two years. His mother was in prison, and he and his sister Patricia were on their own. It was not an easy life for a bright and gifted child. When he was 15 years old, he found himself in juvenile detention for running away from a group home. At 16, he was living on the streets, until one fateful day when he met Bea and Russell Costner. The older couple were in their 70s when they met Jimmy. They gave him a home, the ability to complete his education and most of all, stability and love. "If the Costners hadn't stepped up and given me a home, I would not have survived," Wayne says. "Every good thing that has happened to me, I owe to them taking a chance on a long haired, tattooed kid. The day I rode my bike by their place, and stopped and asked if they had any work I could do was a turning point in my life." Check back throughout the week to read more Grand Success Stories! Now that I have two children of my own, I often find myself wondering how my mother managed to do so much on her own while juggling her career as a chemist. Mornings at our house resembled a three ring circus on a speeding train. Mom often made breakfast and cooked dinner simultaneously in the morning to save time. Always on the verge of missing the bus or eating dinner at eight, WE RUSHED EVERYWHERE…except for Sundays. Until the time I left for college, we went to my grandparents on Sundays after church. Although the more reserved of the two, my grandfather Joseph Principe still found ways to make us feel special. While carving the roast in the kitchen, Pop-Pop (later Grandpa) would sneak us coveted end pieces before the platter headed to the dining room. If Sunday dinner included my dreaded nemesis (baked ham), a sandwich made from leftover homemade meatballs and gravy (aka spaghetti sauce) came out on my plate instead with a conspiratorial eyewink. Grandpa grew up in Brockton, Massachusetts during the height of the depression. His older brother Dominic was a football star at Fordham University in the 1930s, playing with Vince Lombardi and later signing with the New York Giants. My grandfather also earned a football scholarship to Fordham, before breaking his arm his freshman year. He met my grandmother, Ruth Horan, in the stadium stands. Gram was gregarious, warm, lively, and adventurous. When my grandfather got deployed before their scheduled New York wedding to Wyoming for training as B-4 pilot with the Army Air Corps during World War II, she had her father (a buyer at a major New York department store) have a suit made to match his uniform. She flew out to Wyoming by herself to get married. She named my mother for the Mountain Laurel flowers that bloomed where they lived on base. At my grandparents’ dinner table, we learned how to treat china and crystal with care even at an early age. I felt very important when my grandmother served me soda (which my mother only permitted us to drink at their house) from her Waterford crystal for the first time at five. More importantly, we learned how to treat everyone at the table with respect and dignity. As the youngest of five children, my Aunt Claudia was born with Downs Syndrome. Far ahead of their time, my grandparents taught us that everyone should contribute to the best of their abilities and that everyone deserved their place at the table. Claudia was the light and joy of our family. After dinner and dishes, we always played board or card games back at the table. If I set up my grandmother for a good hand, I was “in the will kid.” Through the stories my grandparents told around the card table, we picked up family history that I treasure today. As it turns out, my grandparents gave my mother, brother, and me the greatest gift they could each Sunday: the time to relax and enjoy our family together over food, laughs, and games. Our fifth feature in the NFL Game Day Recipes comes from Melissa Ness. She has kindly shared the recipe that (probably) helped the Green Bay Packers win the Super Bowl last year. Part chili, part mac and cheese—how can you go wrong? Remember to watch the Packers take on the 49ers today at 4:25 PM ET. Don’t forget to say Happy Grandparents Day to the special older adults in your life! In a heavy-bottomed stock pot heat 2 tablespoons olive oil. Add in ground beef, season with salt and pepper to taste. Stir often till the meat is browned and cooked through, about 8 minutes. Drain the beef and transfer to a bowl and set aside. Heat another 2 tablespoons of olive oil in the same stock pot. Add in chopped onions and cook 10 minutes until translucent. Add in celery and carrots, season with salt and pepper to taste and cook another 5 minutes. Add in peppers and cook another 10 minutes, stirring occasionally. Stir in tomatoes, tomato sauce 1 1/2 tablespoons chili powder, cumin, coriander, cayenne pepper and bay leaf. Bring to a boil, then turn down heat to a simmer and cook for 2 hours. Stir in cilantro, corn, beans and 1/2 tablespoon chili powder and continue to cook until the corn and beans are heated through, about 20 minutes. Cook pasta until al dente and serve chili with a generous heap of freshly grated sharp cheddar (preferably from Wisconsin). In honor of the important role grandparents play in our lives, President Barack Obama released a proclamation declaring September 9th National Grandparents Day. Throughout our history, grandparents have guided their children and grandchildren through trial and triumph. For many of us, our grandparents were among our earliest teachers and caregivers. They have added immeasurably to the strength of our families, and with compassion and wisdom, they have enriched our lives with the stories of those who came before us. On National Grandparents Day, we give thanks to those who helped raise us and pay tribute to a generation that still inspires us toward brighter horizons. Our grandparents set the course of an American century. They have witnessed great milestones in our Nation's history, and from the battlefield to the factory floor to their neighborhoods, our grandparents' tireless pursuit of progress has paved the road that we travel today. Just as they helped shape the country we know and love, so have they shaped each of us into who we are as individuals. Our grandmothers and grandfathers have profoundly influenced every part of our society, and as their grandchildren, it is incumbent upon all of us to provide them with the care and support they so deeply deserve. Today, we honor America's grandparents, and we celebrate their indelible contributions to family, community, and country. NOW, THEREFORE, I, BARACK OBAMA, President of the United States of America, by virtue of the authority vested in me by the Constitution and the laws of the United States, do hereby proclaim September 9, 2012, as National Grandparents Day. I call upon all Americans to take the time to honor their own grandparents and those in their community. seventh day of September, in the year of our Lord two thousand twelve, and of the Independence of the United States of America the two hundred and thirty-seventh. To celebrate Grandparents Day and the 2012 NFL season Kick Off, we’re sharing a great success story from Shea McClellin, Defensive End for the Chicago Bears. When #99 takes the field today with the Chicago Bears, he looks forward to once again knowing his grandparents will be rooting for him. “They have been my foundation and walked with me every step of the way. It takes talent and speed to be a good defensive end, but it also takes heart—and for that I have my grandparents to thank. The up and coming football star, Shea McClellin, has his grandparents to thank for his hard work ethic and perseverance. McClellin, the first round draft pick for the Chicago Bears this year, was raised by his grandparents Terry and Jerry on a farm in Idaho. McClellin moved in with his grandparents as a baby when his young mother found it challenging to provide for her son. He has maintained a relationship with his mother, who is very grateful for the support of her parents. ‘‘I’m glad they were able to help, and I’m glad he stayed in the family. I’m very proud of him. He deserves it all,’’ she said. “It was a joy taking care of him,” explains McClellin’s grandmother, “He kept me young. He absolutely kept me young.” And he was not the only child to grow up in his grandparents household. Jerry and Terry McClellin also raised four children of their own and multiple foster children many of whom live with them from when they were in diapers through high school. The values that Jerry and Terry instilled into their grandson are now being passed on to others. Recently, McClellin headed back to Marsing, Idaho to speak to students on the importance of setting goals and dreaming big. You can read more about Shea and other touching stories from individuals across the country raised by their grandparents in our upcoming publication: “Grand Successes”. Check back later this week for the release of our new publication! Our fourth feature in the NFL Game Day Recipes comes from Sheri Steinig. She has graciously shared her Aunt Dianna’s secret cheeseball recipe. Though this is specially made for Redskins fans, Sheri assures the rest of us that we can try it too! Remember to watch the Redskins take on the Saints this Sunday, Sept 9th at 1:00 BPM ET. Don’t forget to say Happy Grandparents Day to the special older adults in your life! 2-8 oz. Philadelphia Cream Cheese-do not use other cream cheese. 1-6 oz. Wispride Sharp Cheddar Cheese (tub size) If you buy the 12 oz. Just use half. Kaukauna is another Sharp Cheddar Cheese to use. Let cream cheese, sharp cheddar cheese and blue cheese set and soften in a bowl for about 3 hours. Spread 1 lb. chopped pecans and sprinkle parsley flakes on a big sheet of aluminum foil before you start mixing the cheese. (Use foil pop-ups for each ball, wrapping the ball in Saran Wrap before you wrap it in the foil.) You need to have these wraps laid out before you mix the balls. I usually have several papers towels handy to wash and dry my hands between molding each ball. It is messy. Mix all 3 cheeses together with a fork, and then add Worcestershire sauce, garlic powder and cayenne pepper. Blend together again with a fork and shape into balls, wrap in saran wrap first and then in foil pop-ups. Place in the frig right away to harden. The recipe makes 1 big ball, 2 medium balls or 3 smaller balls. Our third feature in the NFL Game Day Recipes comes from Marsha Adler. She has graciously shared this delicious snack created by Traci Des Jardins, one of the great chefs and restaurant impresarios in San Francisco. This sweet treat from California is sure to bring some luck to the 49ers! Remember to watch the 49ers take on the Packers this Sunday, Sept 9th at 4:25 PM ET. Don’t forget to say Happy Grandparents Day to the special older adults in your life! Note: When using a candy thermometer, be sure the tip doesn't rest on the bottom of the pot, which will give a false reading. Instead, clip it to the inside edge of the pot and adjust it so that the tip sits about 1/2-inch deep in the sugar mixture. Preheat oven to 350°. On a large baking sheet, toss together peanuts, coconut, and pistachios. Bake, stirring once or twice, until toasted and fragrant, 5 to 7 minutes; set aside. Spray two large sheet trays (with sides) and the tines of 2 forks with cooking spray; set aside. Combine sugar, corn syrup, butter, vinegar, and salt in a large pot. Clip a candy thermometer to the inside edge of the pot and cook over medium-high heat, without stirring, until mixture reaches 300°, about 20 minutes. Meanwhile, combine peanut mixture and popcorn on 1 of the prepared sheet trays. When sugar mixture reaches 300°, immediately remove pot from heat and set candy thermometer aside. Carefully pour hot sugar mixture over popcorn mixture, then use the prepared forks to toss together and coat well. (Work quickly, since the sugar mixture hardens as it cools.) Transfer popcorn to second prepared sheet tray and spread it out. Set aside and cool completely, about 2 hours, then break into bite-size pieces. Serve immediately or store in an airtight container at room temperature. Our second feature in the NFL Game Day Recipes comes from Adam Hlava. He has kindly shared with us with his grandmother’s lasagna recipe that she used to make before Packers games in the winter. After eating a hearty meal, Adam and his family would descend upon Lambeau Field in Green Bay to watch the Packers wallop their competitors. The question is, did they wear their Cheeseheads? Remember to watch the Packers take on the 49ers this Sunday, Sept 9th at 4:25 PM ET. Don’t forget to say Happy Grandparents Day to the special older adults in your life! 7. Cover with aluminum foil, poke a few holes. Put in at 350 degrees, after 30-45 minutes, take out and remove aluminum foil and put back in oven. Bake for at least another 20 minutes then enjoy! What’s your game day recipe? In addition to celebrating Grandparents Day on September 9th, we will be watching our favorite NFL teams play their Kick Off games for the season. Throughout the week Generations United staff will be sharing their favorite game day recipes. Today we’re featuring Alex Cutler’s recipe for Beer Bread. Word has it that when Alex makes his Beer Bread the Washington Redskins win! Remember to watch the Redskins take on the Saints this Sunday, Sept 9th at 1:00 PM ET. Don’t forget to say Happy Grandparents Day to the special older adults in your life! 4. Pour melted butter over mixture. NOTE: This recipe makes a very hearty bread with a crunchy, buttery crust. If you prefer a softer crust (like a traditional bread) mix the butter into the batter instead of pouring it over the top. 5. Bake 1 hour, remove from pan and cool for at least 15 minutes. Join our Grand Faces Grand Voices campaign and make a commitment to do something grand for children and youth in your community, state, or across the nation.